There was smoke, but fortunately for the thousands working or moving in across campus Thursday, there was no fire. 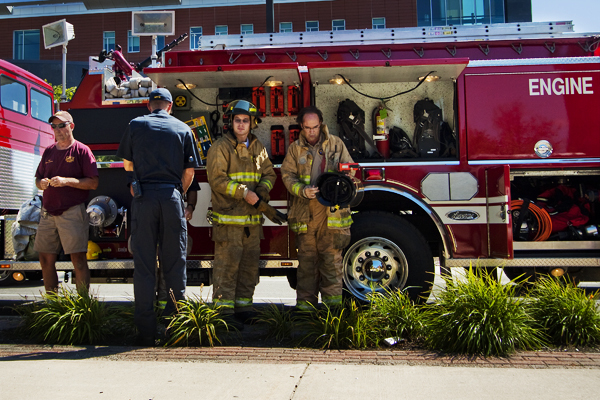 Faculty and graduate students were evacuated from the Dow Science Complex around 3:00 p.m. when the fire alarm was set off by smoke from an elevator motor, but there was no fire, said CMU Police Captain Fred Harris. “There was no damage to the building and no injuries,” Harris said. Physics professor Axel Mellinger was one of the first people to smell smoke within the building. Mellinger said the campus police were the first to arrive, soon followed by the fire department. Stan Hirschi, building manager and also a physics professor, went down to the basement with an officer to check on the smoke. The Central Alert System sent out notifications at approximately 3:15 p.m., advising people to stay clear of the area until further updates. Another notification sent around 3:45 p.m. stated the situation had been resolved and the building was back open.